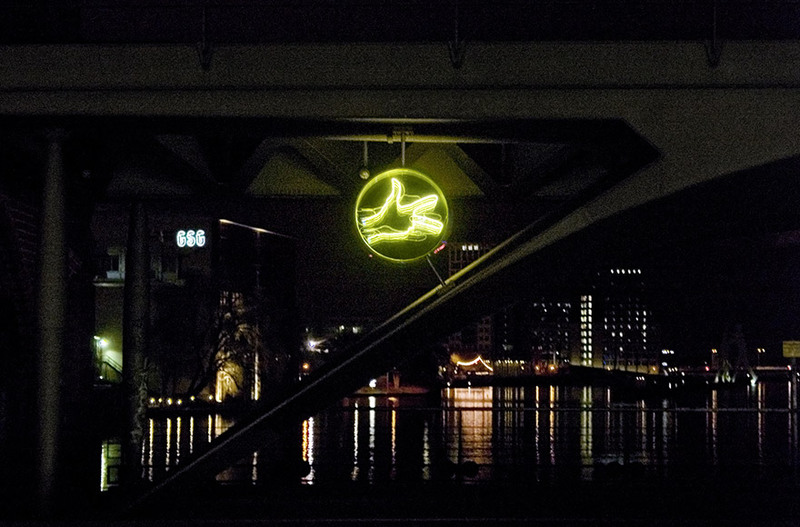 Random­ized neon­signs marking the former fron­tier crossing point Ober­baum­bridge Berlin. Realised in 1997. Commis­sioned by the Berlin Senate Depart­ment for Urban Devel­op­ment and the Envi­ron­ment as a perma­nent marker on the Ober­baum­brücke, the former border crossing between East and West Berlin. 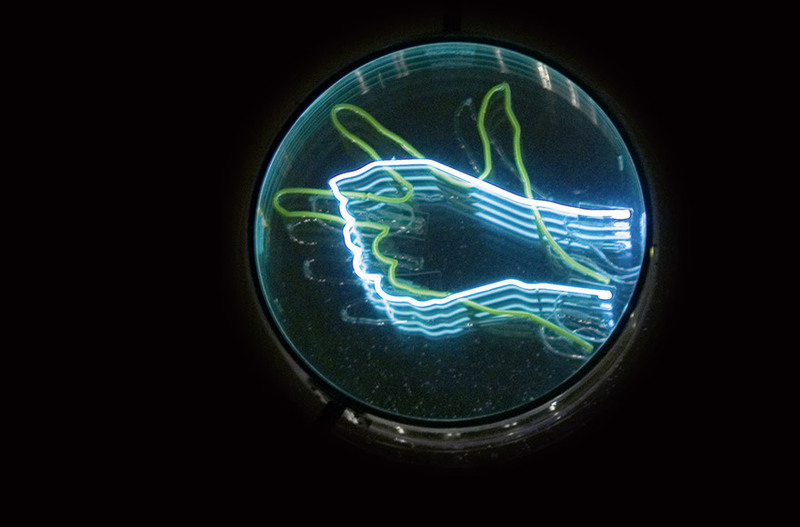 A neon game, powered by a random gener­ator, marks the Ober­baum­brücke, the former border crossing between East and West Berlin. 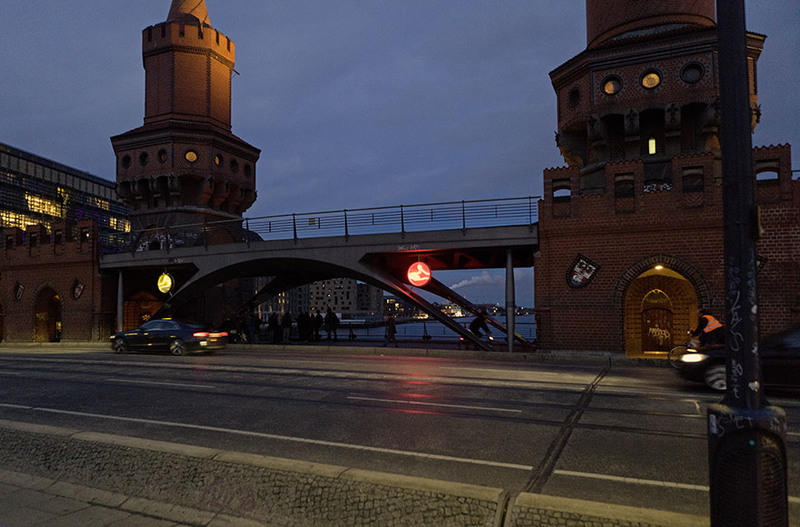 Two round light boxes made from acrylic, each with a diam­eter of 100 cm, are installed in the central span­drel of the elevated railway bridge above the river Spree. 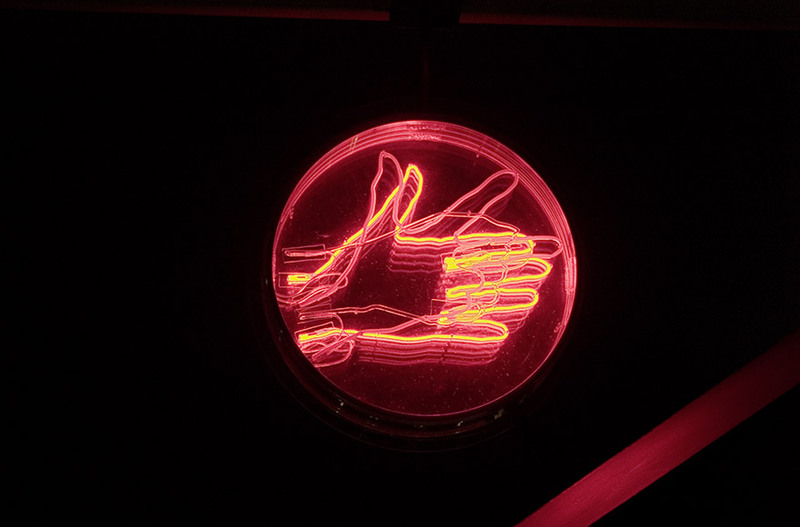 Inside each box are three curved neon tubes (yellow, red and blue) depicting the contours of hand move­ments. These are the gestures of the game “Rock paper scis­sors” to which the title refers: the red line forms an outstretched hand (paper), the yellow line shows splayed fingers (scis­sors) and the blue line forms the contours of a clenched fist (rock). Both fluo­res­cent tube systems are switched on via photo­elec­tric switches from dusk until 1 am. Powered by random gener­a­tors, the hand move­ments change every six seconds. The objects are fairly nonde­script and are supposed to be as common­place as traffic signs. This is no sign visible from afar, but one that is inte­grated in the historic bridge as well as in the newly added centre piece. Rock beats scis­sors, scis­sors beats paper, paper beats rock— just like heads or tails, this game is played throughout the world in order to come to an agree­ment without having to argue about it. Owing to chance, one side is stronger or weaker than the other without gener­ally being either. It is only the combi­na­tion that causes one side to win or lose: rivalry, power games and trials of strength between two oppo­nents are substan­ti­ated in an ironic way in Rock paper scis­sors. Two people stand oppo­site each other and try to come to a deci­sion without argu­ment or violence. 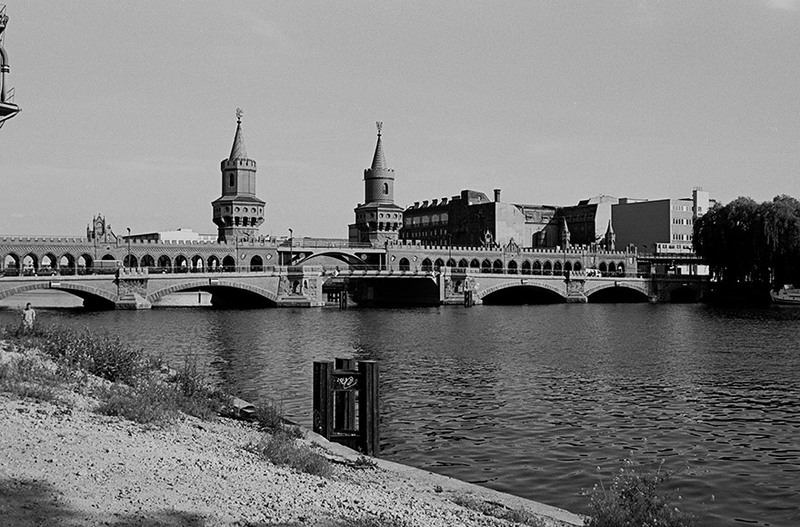 By using this game of chance, the divi­sion of the city and the signif­i­cance of the bridge as a border crossing between East and West Berlin from 1972 to 1989 are put in an artistic context. With reduced styl­istic means, the work asks to what extent polit­ical deci­sions ulti­mately depend on chance, i.e. imply a moment of arbi­trari­ness. Gold­berg builds an imag­i­nary bridge from past to present and raises polit­i­cally explo­sive issues. Play­ful­ness turns into ironic obser­va­tions on the apparent inevitability of compe­ti­tion between polit­ical systems and its histor­ical signif­i­cance. It is a univer­sally compre­hen­sible instal­la­tion.